Over a century ago, a group of concerned individuals banded together to save wildlife and a place known as Yellowstone. The story that follows from the efforts of those visionaries is cherished as one of our nation's greatest accomplishments. Jay N. "Ding" Darling was a Club Member from 1935 until his death in 1962. Over the next several decades, Theodore Roosevelt, along with members such as Aldo Leopold and J.N. "Ding" Darling (see Key Deer cartoon at left), championed the passage of laws, the establishment of institutions, and the designation of wildlands which today make up our nation's conservation system. The National Forest, the National Park, and the National Wildlife Refuge Systems exist today in large part because of the extensive efforts of the Club and its dedicated membership. As a vital element of the foundation supporting our nation's conservation system, the Club began publishing and championing a "fair chase" hunting ethic in the late 1800s. The original constitution of the Club addresses hunting ethics. 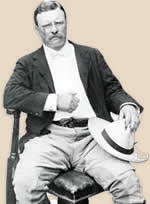 The Club's Fair Chase statement and philosophies later became the foundation for hunting and game laws in this country. In addition to sponsoring numerous research programs and countless symposia, the Club has supported continuing growth of America's conservation system. One of the more enduring examples of Club-supported research is the Timber Wolf/Moose study on Isle Royale National Park conducted by Drs. Durward L. Allen and Rolf Peterson. Sponsored from the beginning by the Club, this on-going study is recognized as the definitive work on predator-prey relationships for these two species. Exemplifying the Club's long-term investment in the future of America's natural resources, this research helped to remove the Eastern Timberwolf from endangered status and helped to change public perception of the wolf. Knowledge gained from research of this caliber helps Boone and Crockett to develop outstanding, ongoing programs for sustaining wildlife populations. The Club promotes outdoor ethics for all people, emphasizing shared use of natural resources to protect options for future generations. Protecting wildlife population habitat on public and private lands, and associated outdoor recreational experiences is a major focus. Fair Chase is the ethical, sportsmanlike, and lawful pursuit and taking of free-ranging wild game animals in a manner that does not give the hunter an improper or unfair advantage over the animal. Fair Chase extends beyond the hunt. It is the very core of outdoor ethics, extending to all who enjoy wildlife and wildlands, or who make use of their resources. Fair Chase has been the Boone and Crockett philosophy since the Club's beginning. The Club is the oldest organization to champion Fair Chase in North America. The hunting and game laws recognized today are a direct result of the statement, philosophies, and efforts of the Club. Theodore Roosevelt and George Bird Grinnell published the Club's first book in 1895. Since then, books published by the Club have spread the word on hunter ethics, conservation and record keeping. Book sales provide funding for the Grants-in-Aid Program. To date the Club has published over thirty-seven volumes on various topics. Some of these include: Records of North American Big Game, Boone and Crockett Club's 26th Big Game Awards, Measuring and Scoring North American Big Game Trophies, as well as many other books, such as A Whitetail Retrospective, Legendary Hunts, and Records of North American Big Game, 12th Edition Paperback. The Boone and Crockett Club expanded communication efforts benefiting wildlife conservation and hunter ethics by creating the Associate's Program for people who support the Club's ideals and goals. Associates receive Fair Chase magazine, the official publication of the Boone and Crockett Club. The Club maintains the records of native North American Big Game as a vital conservation record in assessing the success of wildlife management programs. 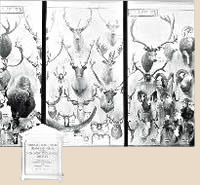 In response to public interest generated by the Club's National Collection of Heads and Horns in the 1920s, and increased hunting by the general public, the Club called on Member Prentiss Gray to help establish an official measurement and scoring system for trophy animals. The Collection of Heads and Horns and the measurement system were initially conceived to record species of North American big game thought to be "vanishing." Club Members and others in the scientific community soon recognized that the system was an effective means of tracking the success of new conservation policies. The Club utilizes the Records of North American Big Game Program to communicate the basics of conservation and Fair Chase to the general hunting public. Since first published, the Club's Records of North American Big Game emphasized that a thorough and keen understanding of species biology and proper habitat management, is necessary to ensure the future of all species. The National Collection of Heads and Horns was established in the 1920s and now resides at the Buffalo Bill Historical Center in Cody, Wyoming. Population data show that conservation practices have had a dramatic, positive effect on the abundance of wildlife in our country. The growing populations of big game and associated wildlife stand as testament to the foresight of Club Members. Today, the National Collection of Heads and Horns is maintained by the Boone and Crockett Club at the Buffalo Bill Historical Center in Cody, Wyoming. 1947, the Club held its first "competition" for outstanding trophies, ranking them by a series of measurements that were refined in 1950 into the current trophy scoring system. Trophy entry now occurs during a three-year period, followed by public display of the finest trophies entered in each category and an awards banquet. Presentation of Boone and Crockett Club big-game medals and/or certificates recognizes trophy excellence. Only top trophies in each category are invited to the Final Awards Judging and only invited trophies remeasured by the Judges' Panel are eligible to receive awards. Place awards are reserved for Fair Chase trophies entered by hunters. Other invited trophies, such as pickups and unknown invited trophies, are eligible only for Certificate of Merit. The East Front of the Rocky Mountains is best described by B&C Past President Bill Spencer as "the Serengeti of North America." The Boone and Crockett Club purchased the Theodore Roosevelt Memorial Ranch (TRM) in 1986. Located on the Rocky Mountain Front, the TRM Ranch adjoins the Bob Marshall Wilderness, the Blackleaf Wildlife Management Area, and prime wildlife wintering grounds on privately owned ranches. Here, the Club conducts habitat research and demonstrates innovative land management practices, as well as conservation education programs. These activities are linked to a program of graduate scholarships directed by the Boone and Crockett Professor's Chair at The University of Montana. Dr. Hal Salwasser was hired as the first professor to develop and lead the Club's Wildlife Conservation Program. Dr. Dan Pletscher was the second person to hold this position. Dan was followed by the former Chief of the U.S. Forest Service, Dr. Jack Ward Thomas, who retired in 2006. The current Boone and Crockett Professor is Paul R. Krausman, who was previously a professor and research scientist at the University of Arizona. In recent years, the Boone and Crockett Club has added chaired professors focusing on wildlife conservation and related issues at Texas A&M and Michigan State, as well as a graduate student program at Oregon State University. In 2001, the Club completed the Elmer E. Rasmuson Wildlife Conservation Center at the TRM Ranch. The addition of the Rasmuson Center at the TRM Ranch will serve as a hub for the Boone and Crockett Club's Conservation Education Program. It provides an effective facility for courses, workshops, presentations, and demonstrations about integrated natural resource management, natural resources education, and special topic seminars. Dynamic and evolving, the conservation program continues to test convention and look for new solutions to ever-changing challenges. However, the essential character of the Boone and Crockett Club has changed little in its century of existence. In the Club's 1910 history, founding member George Bird Grinnell stated, "It has not been the Club's practice to announce its purposes, nor to glory in what it has accomplished, but rather to move steadfastly forward, striving constantly to do whatever fell within its province which would tend to promote the country's welfare...a small body of individuals, scattered all over the country, working individually and constantly on behalf of things once laughed at or unknown, but now as familiar to the public mind as household words. The results accomplished by the Boone and Crockett Club bear testimony to the alertness and energy of its members, and to the success of the methods which they have pursued." His words accurately reflect the Club today.